I joked a few posts ago about bringing home a 10 foot long cephelopod fossil. Well, that has yet to happen. 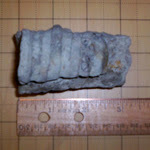 I did find a cephalopod fossil though. About a month ago I took some Girl Scouts to Lilydale Regional Park in St. Paul to look for Ordovician aged fossils. We found the usual suspects in the usual spots and after the group left I ate a quick lunch and headed back into the park to scope out some other sites. I've never had time to fully explore the site so I was looking forward to seeing if there were some other spots I could take groups. I also did a little more exploring in the stream bed and that's where I found this gem.